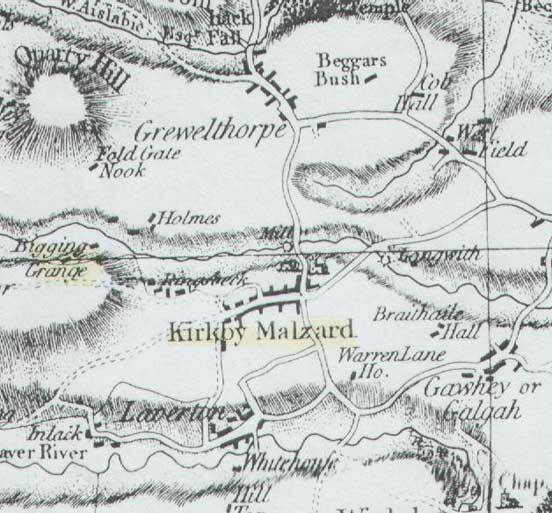 This 1775 map of the Grewelthorpe area shows where Beggars Bush farm was. Grewelthorpe, West Yorkshire Beggars Bush 1775. Beggars Bush Farm was an isolated farm near the village of Grewelthorpe in the Parish of Kirkby Malzeard, West Yorkshire, about 8 miles from Ripon. It is an example where there is a documented alternate simple Bush name, which survives. The name Beggars Bush is recorded on Thomas Jefferies map of the West Riding dated 1775 next to a building some distance from the nearest lane. No building is shown on a map dated 1600, which shows the field as pasture. This name is recorded as late as 1915 in Robinson’s District Directory for Grewelthorpe. It appears to be at the location of what is now known as Bush Farm. Remarkable Baptism Registers for 28 & 29 September 1844 for two daughters of William & Ann Hammond give their address in one as Beggars Bush, and the other as Bush Farm. Notice in Leeds Mercury November 1838. Neil Howlett has been researching the Beggars Bush name and he sends the following comments. Most Beggars Bush place names come from a phrase common in the Elizabethan period “to go by beggars bush” meaning to fall on hard times often through ones own folly. He thinks it was distributed by literature, particularly a play of that name by Beaumont & Fletcher was very popular until the 19th century and performed at fairs and other informal locations. Another route for distribution was a prominent hill of that name on the 1576 map of Huntingdonshire by Saxton which was reproduced for over 200 years. The place name is less common in the North. It seems to be associated with marginal land, and commonly changes. In many places such as the Huntingdonshire example it is connected with a change to a Kings name. 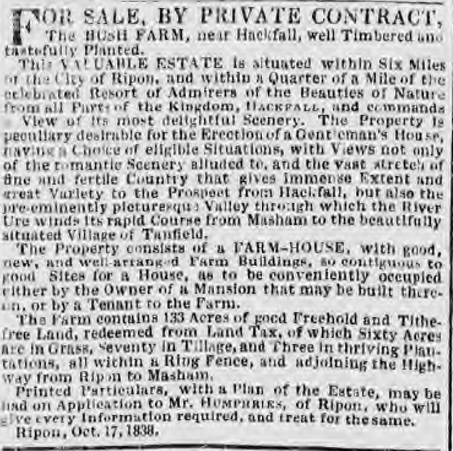 In 1855 Bush Farm Grewelthorpe was occupied by Thomas Auton The farm was offered for sale by auction following the will of Samuel Wrather See the details of the will in the history section of this site. On Jan 19th 1870 Miss Elizabeth Wedgewood of Bush Farm, Grewelthorpe married Mr William Fletcher. of Ripon in Ripon Cathedral. [Ref. Knaresborough Post 1870]. Dau of Thomas Wedgewood. In 1876 The Farmer at Bush Farm was Robert Wright [Ref. Knaresborough Post 18th Nov. 1876]. He advertised for sale by auction stock and dairy utensils, implements and produce. In 1884 John Thomas Pattison gave his address as Bush Farm, Grewelthorpe when he married Mary Jane Heath in Saltburn-by-the-sea. She was the daughter of William Heath of Northallerton. 1868. Amongst other offences he had tried to obtain the tenancy of Bush Farm from Charles James Burrill of Middleham in 1890 by false pretences. In 1898 William Thompson of Bush Farm was nominated for Parish Council. The farm was mentioned in a 1915 directory. When Wm Thompson was living there. See the item “directories” in the History section of this site. William died in 1931.